Congratulations to Denise Peloquin, Enhanced Vision's October Pebble Website Drawing Winner! Congratulations to Denise Peloquin, Enhanced Vision’s October Pebble Website Drawing Winner! Enhanced Vision would like to congratulate Denise Peloquin as our October Pebble Drawing winner! We are very excited to hear that Denise will be getting great use out of Pebble, hand-held portable digital magnifier. 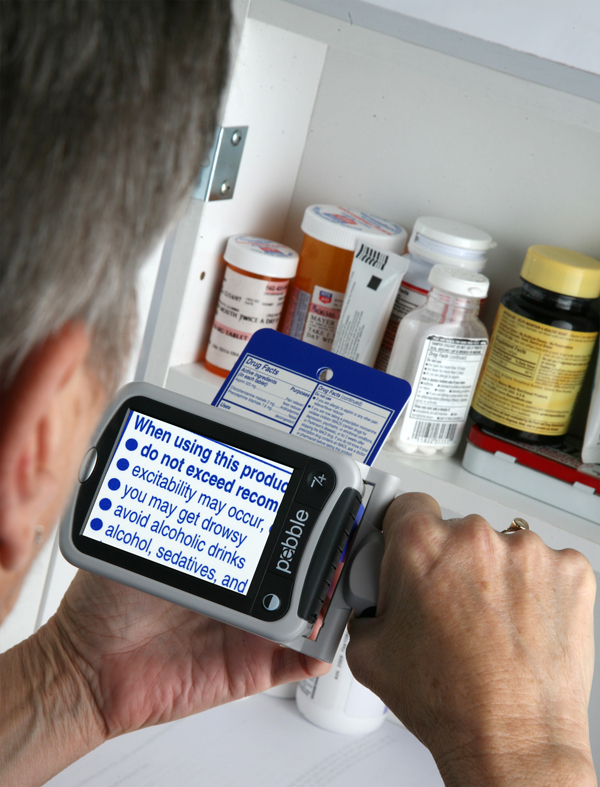 Pebble is the only hand-held magnifier you will ever need for your low vision needs. Thank you so much! Wow, was I ever excited to hear that I won a Pebble! This electronic magnifier will benefit my life in so many ways every day. I have been using standard hand-held magnifying glasses for years but they no longer provide the help I need. Eight years ago, I was diagnosed with plaquenil retinopathy–plaquenil was a medication I had been taking for autoimmune disease and arthritis. For unexplainable reasons, the plaquenil built up in my retinas causing blind spots in my vision. Eye specialist have told me this was a one in a million occurrence and there is nothing that can be done. Soon after, I could no longer drive and two years ago, at age 57, I had to retire after 40 years of federal employment as I could no longer perform my duties as a secretary. Unfortunately, the condition continues to gradually take away my sight. However, I remain upbeat and accepting of that which I have been dealt. The Pebble will be my eyes. I say this because whenever I reach for a magnifier, it’s like I’m putting on my eyesight, like a person who needs to put on a pair of glasses or contact lenses. It will be an indispensable device throughout my life. Thank you again and thank you Enhanced Vision so very much for allowing me to have won the Pebble. I cannot wait for it to arrive and open up my world. Don’t forget to sign up for your chance to win the Pebble for the month of November! Click here to be entered into our next Pebble drawing!